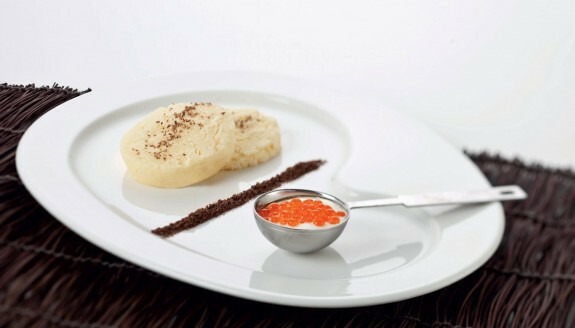 Place 2 blini on a plate, put the caviar in a spoon with a dab of sour cream on top and dust with the bittersweet chocolate. Garnish with starflowers. Whisk 100 g of cooked, strained potatoes with 250 g butter and 250 ml of warm milk with an egg beater; add a pinch of salt and nutmeg. Room temperature – strain the warm potato purée and egg whites through the iSi sieve pour into the 1 L iSi Gourmet Whip using the funnel. Then screw on 2 iSi cream chargers and shake vigorously. Allow to cool for 3 hours. Mix the sour cream and season with salt and pepper. Grate the bittersweet chocolate into dust using the fine micro-plain and freeze. Place 8 blini – the potato/egg white mixture – (approx. 3 cm in diameter) on to the Anti-Griddle™ and let freeze, turn and freeze on the other side. The blini should still be somewhat creamy in the middle.